I've discovered that, after all these years, I was never really getting the balance break for shiho nage quite right. 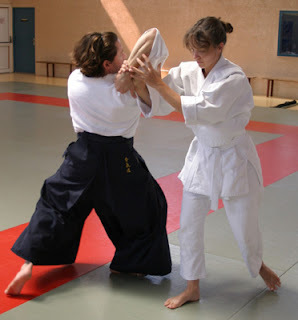 The same goes for mae otoshi, or any other technique that begins the same way. I think it comes from starting our training looking at a technique from the stand-point of choreography: step here with this foot, put your right hand here, step there, turn, etc. etc. I think that's the way we need to start, working on ourselves first. But after a while, we find that, though we have the movements down (kind of), the technique still isn't quite working right, or maybe only works some of the time. That's the point I think we all make a transition from thinking about what I'm doing, to thinking about what's happening to uke. We move from an inward focus to an outward one. We think less about how to do something, and more about why we do it. Shiho nage, for me, is one of those techniques about which I'm starting to make a number of realizations. (Not that I've mastered it, mind you, but I'm learning!) The entry, for one, is interesting to me. I thought so long about where to step, and what to do with my hands, that I never really considered what I need to do to uke. Take a look at this video and see if you can spot what I mean. Not only is tori getting off the line and getting the grip, but he's causing enough of an imbalance in uke that uke's leg can't help but swing back and away from tori. Which—huzzah!—makes the motion for doing shiho nage come so much more natural. Oddly enough, I don't think I truly understood what needed to happen until I had enough students try and do shiho nage to me in recent years, and I realized I could totally counter it if I wanted to (and often did in randori). I had to really think about what was happening—or rather, what wasn't happening—to allow me the chance. Another interesting element that I've noticed some aikidoka do (although not the chaps in this video) is using one hand to intercept the strike (say the left if uke is attacking with his right) and put my other hand (my right in this example) in uke's face, basically as an eye threat (similar to the entry for kubi guruma from owaza ju pon). It seems like this causes even more of the turning reaction I talked about earlier as uke flinches his head back; plus, it also serves as a bit of added insurance against uke's other hand. Is it necessary? I don't know, but I think it's interesting. I will say that the idea of reaching over to uke's attaching arm with both of my arms makes me a tad nervous. If I fail to get his balance, uke is behind my elbow, a place I don't really want to be. Fun stuff. I look forward what else I will discover as I continue to look outward. This way there is no opening, it's reassuring and works more smoothly. I just stumbled across your blog. Thanks for the tips. It is nice to see the process of discovery continuing for someone as experienced as yourself. I like what you are saying about Shiho-nage here. It is an aspect that I am continuing to work on.